April 16, 2013 By This post may contain affiliate links. 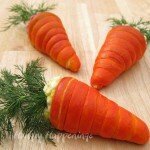 Instead of buying a normal bouquet of flowers, make some that you can look at and eat! 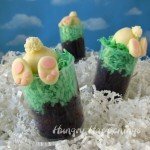 These Daisy Cakes are the perfect dessert for any occasion, and while they’re beautiful they’re also amazingly delicious! Winter seemed endless this year. If it weren’t for the ray of sunshine my exchange student has brought to our home, I would have felt the deep gloom of the season. 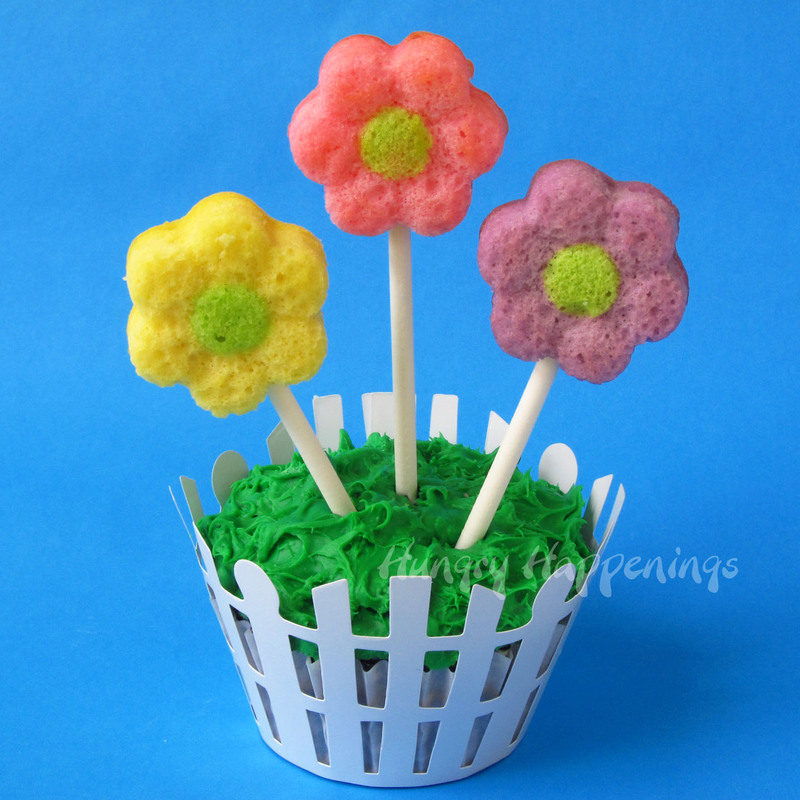 To celebrate the long awaited arrival of sunny skies and warmer weather, I made some brightly colored Daisy Cakes. 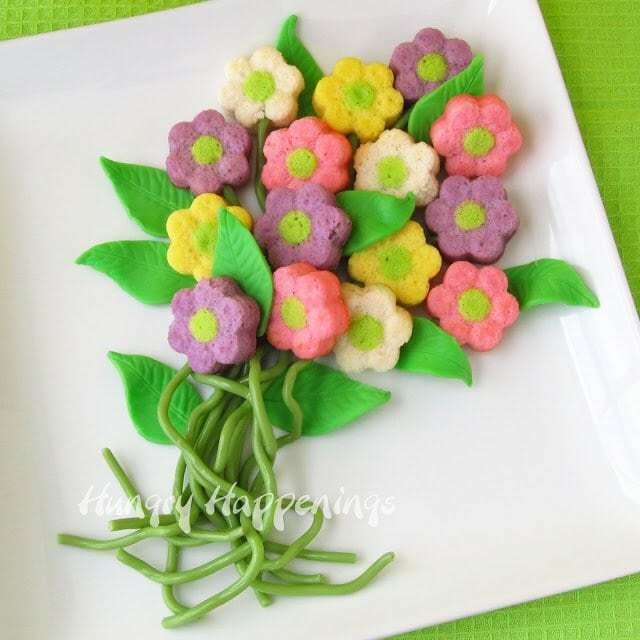 Each tiny little flower is hand painted using cake batter. 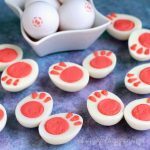 Once baked, these beacons of spring can be arranged in bouquets, used as simple cupcake toppers, or simply served in a bowl for special occasions like Mother’s Day, bridal showers, baby showers, birthdays and even Earth Day. I just wanted to celebrate the fact that although that darn groundhog lied and the cold and snow hung around well into April, that the flowers have finally begun to bloom. There may only be daffodils and tulips in my neighborhood, but more flowers are popping up every day. Daisies grow in a rainbow of colors and they are so cheerful. These tiny cakes just make me smile. I love the large bouquet that I arranged adding modeling chocolate leaves and green licorice lace stems, but even a smaller, simpler, arrangement is quite lovely. I hope these flowers make you feel warm inside, especially for those of you who are still enduring frigid temperatures and snow covered streets. If you don’t yet have flowers in your yard, you can at least make them for dessert. 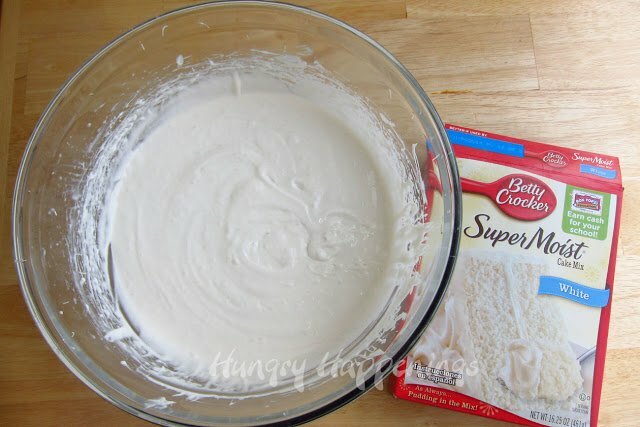 Prepare your white cake according to the package instructions or using your favorite recipe. Preheat your oven to 350 degrees Fahrenheit or the temperature used to make your recipe. 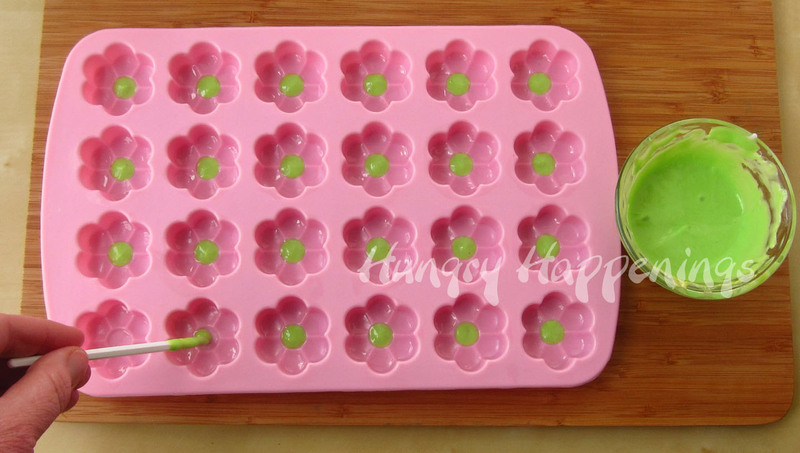 Grease your silicone daisy mold using vegetable oil or shortening. Color about a tablespoon of the cake batter using green food coloring. 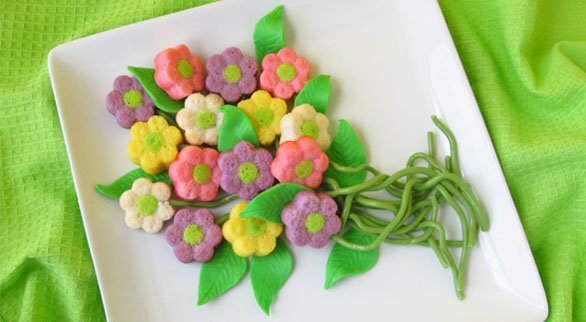 Use a clean, food use only, paint brush to paint the center of each daisy with the green cake batter. Freeze for 15-20 minutes. While the mold is in the freezer. Equally divide the remaining cake batter into 4 bowls. Leave one bowl white. Color one bowl using pink food coloring, one yellow and one violet. Remove the mold from the freezer and spoon the colored cake batter over the green dots filling the daisies about 3/4 full. 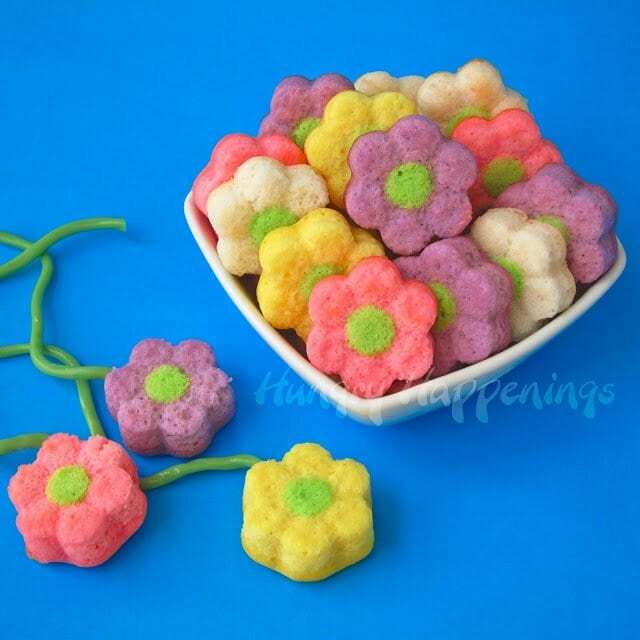 You will have enough batter to make more than 24 flowers. 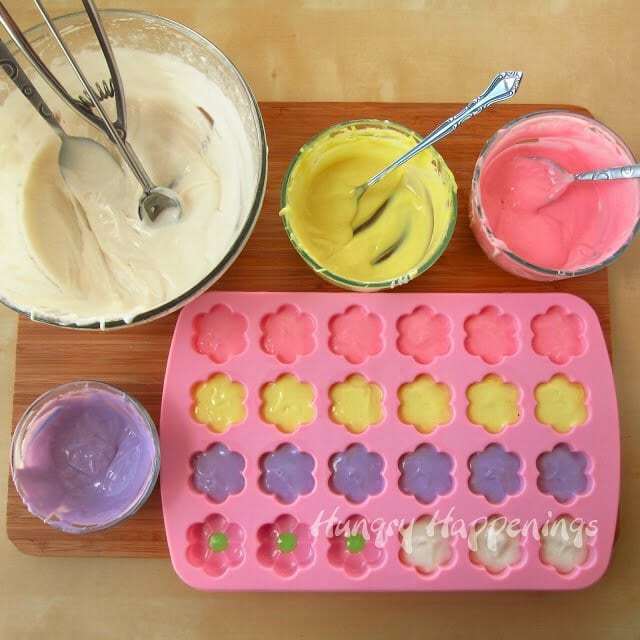 I used the extra to make a few cupcakes, but if you have two daisy molds you can make more flower shaped cakes. Bake for 8-12 minutes until just lightly browned around the edges and a toothpick comes out clean. Allow to cool for an hour in the silicon mold. 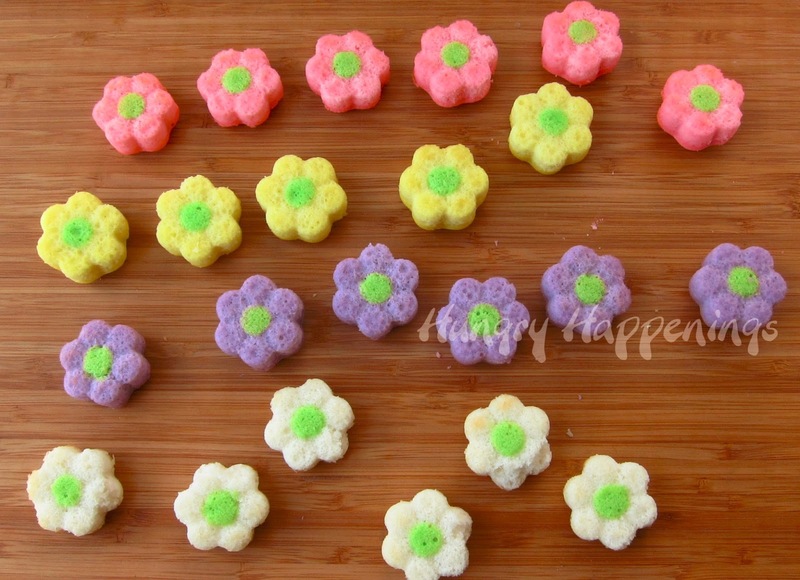 Carefully turn mold upside down and gently press on the back side of each daisy. If your daisy cakes don’t pop out nicely, you may need to place the mold in the freezer for about 15 minutes, then try again. Your mini daisy cakes are now ready to serve. To use them as cupcake toppers simply insert a 4 inch lollipop stick into a daisy and press the opposite end into a cupcake that has been covered in green frosting. For a nice touch, put the cupcakes in picket fence cupcake wrappers. To create bouquets, insert a long piece of green licorice lace into the daisies. 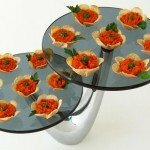 Arrange on a platter. If you’d like, you can add green leaves. 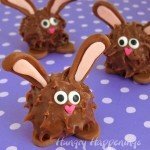 Use a cookie cutter or plunger cutter to cut modeling chocolate (recipe here), fondant, or green taffy into leaves. Simply arrange the leaves among the flowers. Love this idea! Really love the cupcakes!! Thanks, Jill. When I made these I couldn't make up my mind how to use them, so I decided to share more than one idea. Super cute! Pinned 😉 Thanks for sharing!! Thanks for the pin, Brenda! So cool! 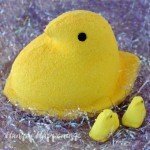 You are an artist with those silicone molds, Beth! Do you get most of your molds on Amazon? I was wondering why you put the mold in the freezer after adding the green batter? Is it something you have to do to keep the colors from blending together? Thanks Janine! Yes, I do often buy my molds from Amazon. They have a huge selection. Wilton molds are also available at many craft stores and cake decorating stores. If you happen to have a Christmas Tree Shoppe near you, they sell silicone molds at unbeatable prices. Yesterday I found some graduation cap molds for $3.99. Oops, I forgot to tell you that yes, I freeze the green batter so that it doesn't bleed when I add the other color. Sorry for missing that earlier. These are so cute. I will have to try this. Just brilliant! How do you come up with such incredible things?!? What a beautiful bouquet – better than fresh flowers! Makes a great gift for mom! they are so pretty. great for mother's day or a spring birthday or brunch! Wow, I just checked out your post about the melted mold. I've not used an ice cube tray in the oven before and now I'm glad I haven't. I've had good luck making caramels and gumdrops using them, they can withstand that heat. Thanks for sharing your experience. It's good to know. Love these!! So cute and a great Mothers Day treat. I would love for you to come and share these on our Much Ado About Monday link party. Precious! I have a granddaughter who will love this idea! Thanks for sharing. I found you on Hungry Little Girl. Great feature. Drop by my kitchen when you have a chance. We're having a party on Monday – What'd You Do This Weekend? Goes live at midnight Sunday. I'd love for you to share these little flowers there. Adorable! thanks for sharing on Mix it up Monday! These are cute!! About how much batter goes into each bowl so it's equal amounts? I just recently made a cake and measured 26 ounces of batter, so you'll need a little over 6 ounces for each flower color and the additional small amount for the green. I love the different cakes miami fl they have, it has such color and wonderful designs and unique creations. Hi Beth, they are amazing! If I don't have ready-to-use batter what recipe I should use? I never made cup cakes – I never liked them as they were always so big. But those look the perfect size to me. You can use any recipe for a white cake. 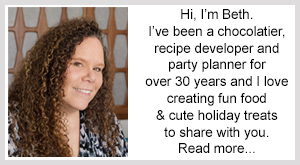 I don't have one one my blog, so you'll need to just do a search for white cake recipes. Come to think of it, I don't know that I've ever made a white cake from scratch before. I need to look into that!